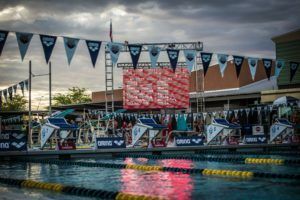 U.S. National Teamer and Olympic champion Nathan Adrian took home the title in the 100 meter freestyle on night one of the Arena Pro Swim Series in Mesa, Arizona. 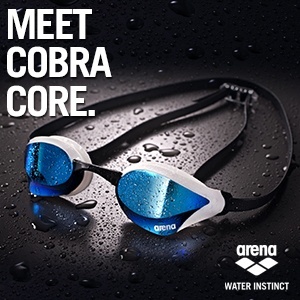 Adrian finished way ahead of the field as the only swimmer to break the 49 barrier. 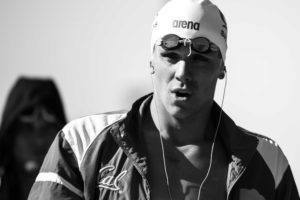 Adrian finished in a time of 48.18, the second fastest in the world this year. Finishing in a distant second was Brazilian and former Louisville Cardinal Joao De Lucca at 49.67. More impressive than the time may be the way with which Adrian attacked the race, taking out the first 50 in 23.24 and coming home in 24.94. The final time of 48.18 is just over the time that he went in the finals in Rio of 47.85. In Rio, Adrian split 22.67-25.18. This new strategy was first apparent in Indianapolis, where Adrian split 23.9-24.7 for a 48.66 final time. As the 2017 World Championships in Budapest approach, it seems that Adrian is continuing to experiment with controlling the first 50 in order to have a stronger back half. 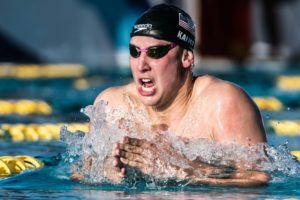 What makes these times so encouraging is the likelihood that Adrian is not fully rested and is saving a full taper for Worlds in July. 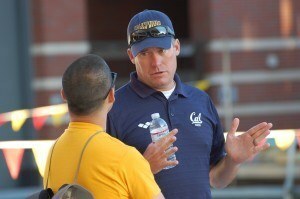 Right now, Adrian is planning to swim at least 2, and maybe 3, more meets before the World Championship Trials. 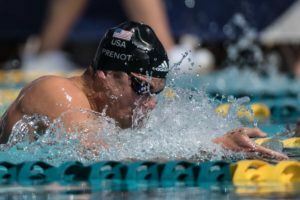 He’s said he’ll race at the Swim Meet of Champions/Masters Nats in late April, the Santa Clara PSS (close to home for him), and is still considering the Atlanta stop of the PSS. That gives him a few more opportunities to test his new pacing before it really counts from June 27th-July 1st. « Could China Knock Off the USA In Budapest In The 4×100 Medley Relay?